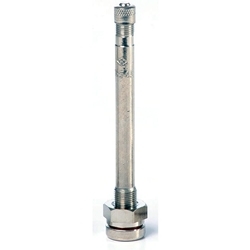 Nickel Plated Brass Valves with O-Rings TR #545, 3-1/2" Straight BOWES TV 27-545 Bag of 10. Application: For aluminum wheels with 9.7mm (0.382"/0.394") valve hole and rim thickness of .218"-.330" at valve hole. Recommended torque at installation: 80-125 in-lbs.